How did this person hear about St. James: From Stony Brook Hospital. Mrs. Barbara Diamond arrived to St. James Center for Rehabilitation and Healing on April 17, 2017 from an inpatient hospitalization at Stony Brook University Hospital in Stony Brook, New York. Mrs. Diamond originally admitted to the hospital due to concerns about her blood pressure. While at Stony Brook Hospital she was given an IV treatment; however, shortly thereafter, she developed a blood infection. Mrs. Diamond was then administered antibiotics to combat the spread of the infection. She stayed in the hospital for four weeks. Shortly after her stay at Stony Brook, she came to St. James Rehabilitation for our best healing care. In her beginning stages she was given a PICC Line that was installed to help with the infection. During her four weeks at the hospital Mrs. Diamond was losing her range of motion. When the hospital decided to send her over to St. James, she shortly realized this was going to be the best place for her to get heal. Stony Brook re-assured Mrs. Diamond; that we were a skilled rehabilitation community capable of providing her level of care. Upon Mrs. Diamond’s arrival she was warmly greeted by multiple professionals of Team St. James who anticipated her arrival. Within the 24 hours, she was greeted by clinicians, therapist, physicians, administrative staff and many other valued members of the team to welcome her and answer any questions the she or her family may have had. 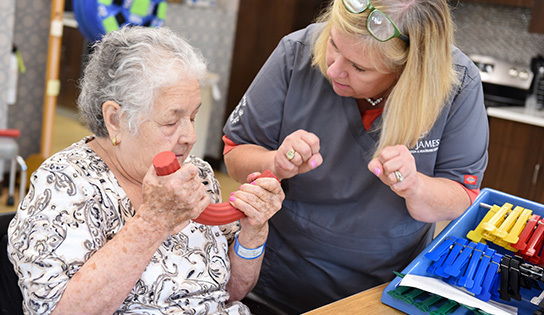 Her physical therapist, Josh, and her occupational therapist, Celeste, began her therapy program to evaluate her current state of health and mobility. Mrs. Diamond began to get much better, beating the odds of her blood infection. She was also very happy mid-way through her healing process as she was able to remove the PICC line. From that moment forward, she then graduated to being able to walk alongside her therapist up and down the hallways and up and down the stairs. During the program, she worked very hard to maintain the successful movements that she has gained while being at St. James. After 30 days in rehabilitation she was walking well over 100 feet. Soon after Barbara was introduced to an at-home simulation to practice skills in performing her activities of daily living, which included bathing, transfers, dressing, grocery shopping, and being able to transfer in and out of a vehicle. During Barbara’s activities of daily living exercises, Josh stressed the importance of lower-extremity strength-building in efforts of her supporting her own hips. Josh followed by devoting a great deal of their therapy minutes to exercise programs that would facilitate weight bearing movement. Celeste would often provide continuing education material for helpful tips in transitioning from rehabilitation goals to home essential needs. On July 22, 2017, Mrs. Diamond was discharged home. She cannot wait to utilize all the great qualities and tools she has gathered from St. James Rehabilitation and Healthcare at her own home. Her goal is to be able to motivate herself to continue all her wonderful therapy. Team St. James is thrilled for Barbara and the incredible strides she has achieved while under our care. We wish her nothing but the best and a continued happy and healthy 2017!